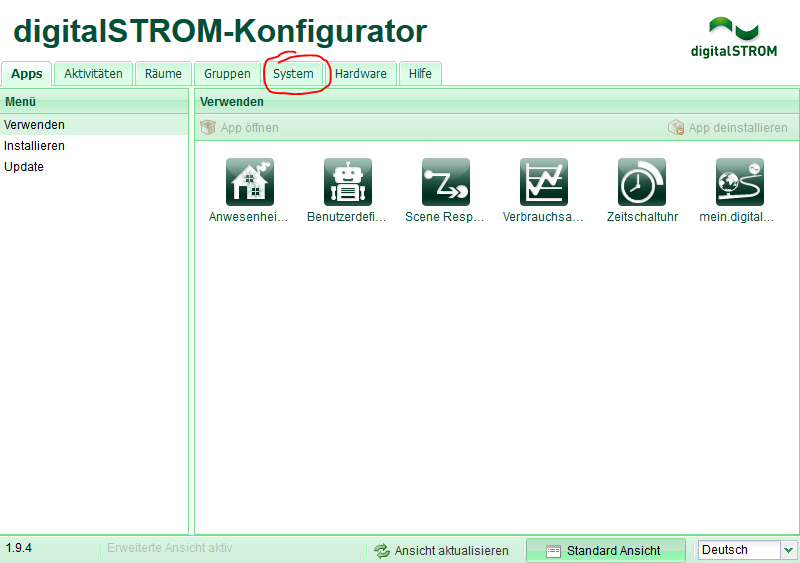 The current software version numbr can be easily viewed in the configurator: It is displayed always on the bottom left. Note: If a software update is performed for version 1.10.4 or an earlier version, the browser will lose connection to the server during the update (due to a newly introduced security feature). Please restart the browser after approx. half an hour. As there will be also issues with the apps, the browser cache must be deleted after updateing the apps (please see below). Note: If a software update is performed from the very old version 1.8.1, it may happen that the dSMs are no longer displayed after the update. In this case, please restart the dSS and run the software update again, then the dSMs will be updated and everything will work well again. 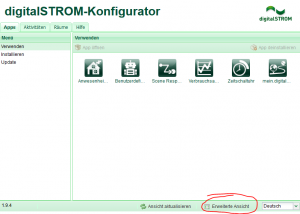 Click on "extended view" in the digitalSTROM configurator. 3. 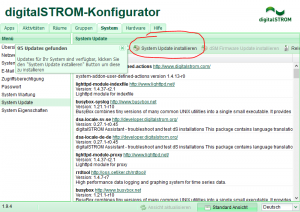 Click on "system Update" and then "browse for updates". 4. 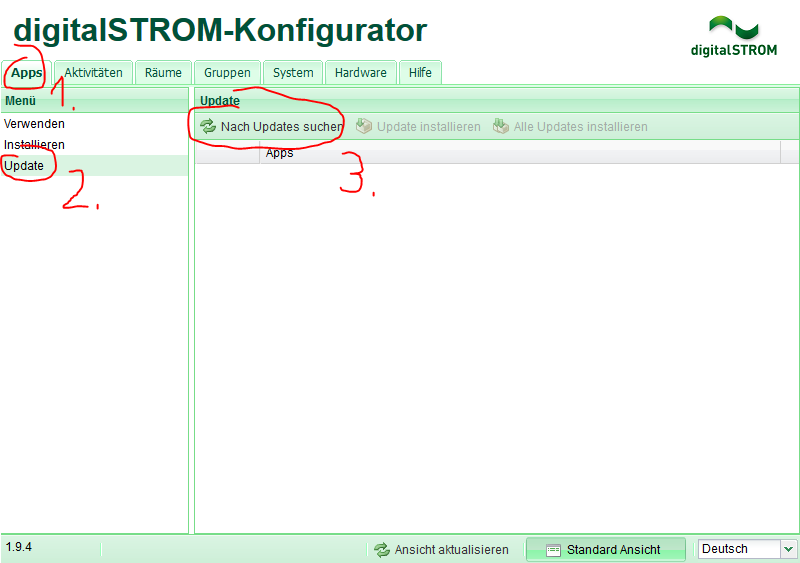 Now click on "install system update". 5. Now the software is updated on the dSS and immediately after that all dSMs are updated. Note: If dSMs are added later, they may not appear in the hardware tab if the software version of the dSMs is too old. 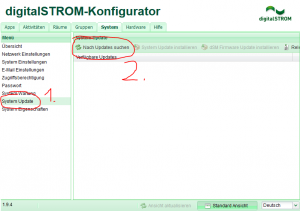 In this case, be sure to perform a dSS software update again as described in points 1 - 3. 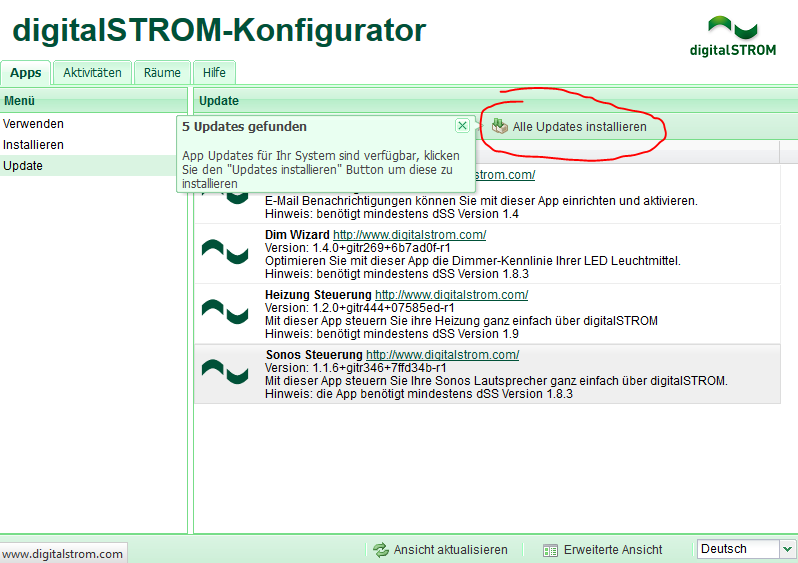 Afterwards the dSM firmware is either updated automatically, or you can click on "install dSM firmware update". Extract ZIP file and copy the "dss11-usb-upgrade" folder directly into the main directory of a 1 GB (or larger) USB stick. Connect the USB stick to the dSS. The update process will now start automatically. It may take up to 2 minutes for the update process to be signaled by the dSS LED flashing. If the LED is solid green, the process is complete. 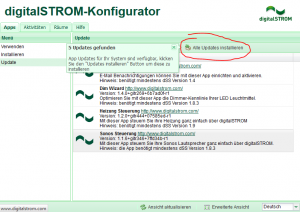 Now perform points 1 - 5 as drescribed above under "updating the dSS & dSM software with internet connection" to update the dSM firmware as well. 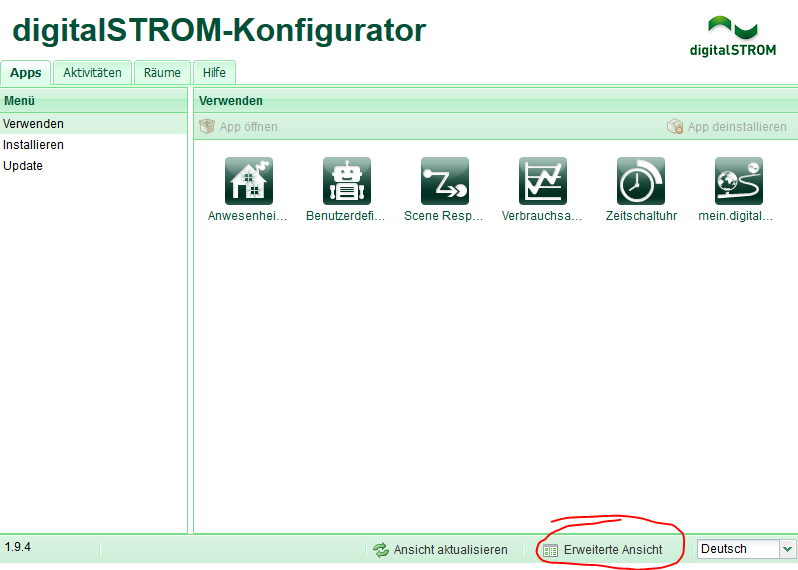 Note: If dSM are added later, they may not appear in the hardware tab if the software version of the dSMs is too old. 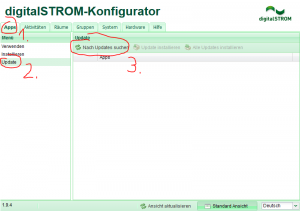 In this case, be sure to perform a dSS software update again, as described in points 1 - 3 above under "updating dSS & dSM software with internet connection". 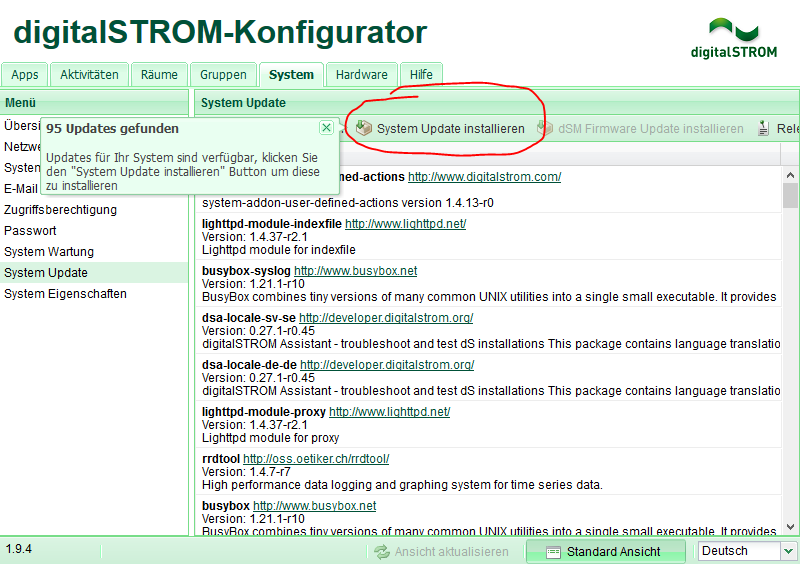 Afterwards the dSM firmware is automatically updated, or you can click on "install dSM firmware update". Afterwards, the apps that were added later, must be updated on the dSS (the default apps are already updated with the system upgrade). Please proceed as follows. If the update was carried out via USB, please leave the USB stick plugged in. In the tab "apps" first click on "update", then on "check for updates". The updates found will be listed. Please click on "install all updates". Note: If a software update is performed for an earlier version than 1.10.4, the apps will not start properly anymore (due to a newly introduced security feature). Therefore, the browser cache must be deleted after the app update. If a dSS is used as a "gateway" in the fuse box, then this dSS must also be updated. The dSMs connected to it are only then updated! The procedure is the same as described above. If a Plan44 bridge is used to connect Dali, EnOcean or HUE components, these must also be brought up to date. 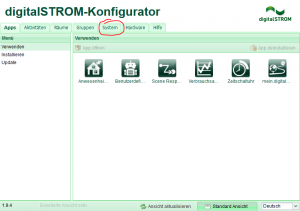 Open the hardware tab in the digitalSTROM configurator. Now click on a virtual meter of the P44 bridge with the right mouse button (in the hardware info field the name P44-DSB-... is displayed) and select "open configuration interface". The inteface of the P44 bridge starts, dthe default login is: User vdcadmin, password vdcadmin. 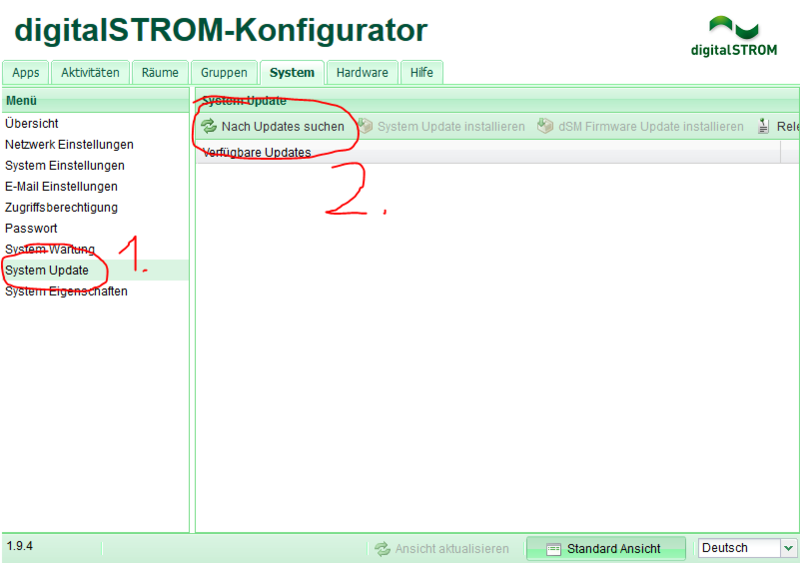 Then click on "system" and "check for new firmware version". Note: The Plan44 interface can only be called locally - unfortunately this does not work via my.digitalSTROM connection. Finally, all smartphone apps should be updated. In most cases, the smartphones already do that automatically.